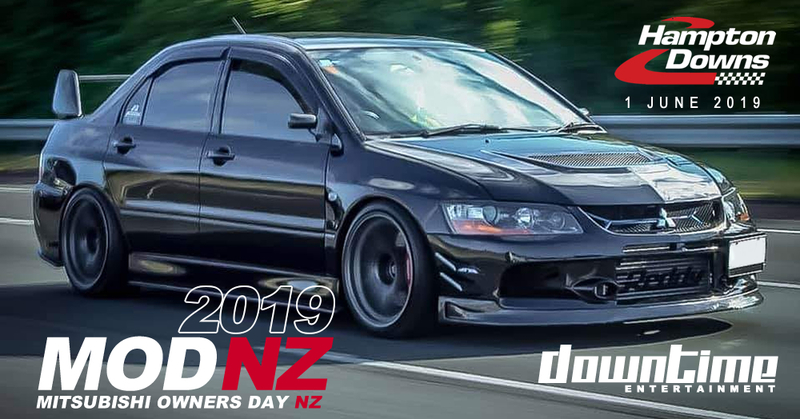 MOD (Mitsubishi Owner's Day) is returning to NZ in 2019. Open to ALL Mitsubishi vehicles, features include, cruising sessions, WORLD RECORD ATTEMPT (Number of Evo's & Mitsubishi vehicles on track), drop flag drag racing, show & shine, gymkhana + more. All entries cover 1 vehicle + 1 driver for the day. Spectators can purchase tickets separately at the gate. Cars must have a current WOF or a Motorsport NZ log book. Track entry gives the registered driver access to all activities at MOD e.g. flag drop drag racing, cruising, gymkhana and show & shine. Only .jpg, .jpeg, .gif, .png formats allowed to a max size of 4 MB. NOTE: Your competitor gallery image will only look as good as the photo you have uploaded. Photo's with minimal/no watermarks work best. Payments made to: Account Name: "Downtime Entertainment Ltd"
Downtime Entertainment reserves the right to use any photograph/video taken at the event without the expressed written permission of those included within the photograph/video. Downtime Entertainment reserves the right to refuse entry to any person(s). All entrants must conduct themselves in a well-behaved manner at all times. Downtime Entertainment reserves the right to add/remove trophy categories. Downtime Entertainment reserves the right to inspect vehicles for alcohol upon entry to the venue. Failure to comply with the 'conditions of entry' will result in dismissal without refund. Please make sure your email address is correct. All important information will be emailed to you for your reference so you know what is happening on the day. Downtime Entertainment cannot be held responsible for any data entry errors. After clicking the SUBMIT button your entry will be processed and you will be issued with a registration number. Once we have picked up your payment by direct debit, we will then confirm your entry via email within 1-3 working days. WELCOME TO 2019 MOD MITSUBISHI OWNERS DAY.